The ceiling of Rawer tomb. Photo Credit: Ahram Online. 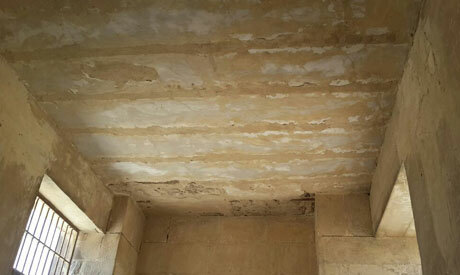 The ceiling and western wall of Rawer tomb in Egypt collapsed last week. However, according to the manager of the site the collapsed parts were modern repair works. The tomb of Rawer, a fifth dynasty official is situated at the Giza plateau, with the roof raised about 30 cm above ground level. The tomb was discovered in 1929 by Egyptologist Selim Hassan who put together various parts using steel and cement as part of a conservation project. The only intact parts of the tomb when it was first discovered were two chapels. the first with various engravings of Rawer with deities and family members, and the second with a large statue of the official. Last week, according to Omar al-Hadary, general coordinator of the Antiquities Ministry independent trade union, the ceiling western wall collapsed when trekking horses walked over the roof. However, Ashraf Mohie al-Din, manager of the site’s archaeological department said that the parts that collapsed were all modern repairs from the 1900s, and all the ancient parts of the tomb are still in good condition.